Dishonored: Death of the Outsider is out today, and Bethesda have released a violent launch trailer to go alongside it. Dishonored: Death of the Outsider finally delivers on the series’ social stealth. 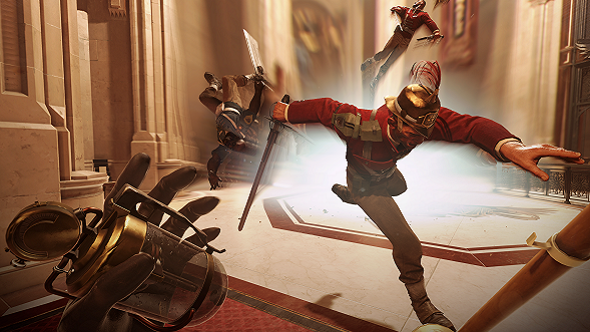 The trailer features the expansion’s protagonist, Billie Lurk, who we first met in The Knife of Dunwall, the first DLC for Dishonored. There, she was working alongside the assassin Daud, who was responsible for killing the Empress right at the beginning of Dishonored, setting the whole series into motion. Death of the Outsider takes places more than 15 years later, and Billie has relocated from Dunwall to Karnaca. She’s a character wracked by guilt over the actions of her past, and, as you might be able to tell from the expansion’s title, feels that killing the mysterious Outsider, the gothic figure who presides over Corvo and Emily’s fates throughout both Dishonored games. The trailer is reasonably light on story, but what it’s very good at is showing off all of the grisly tools at Billie’s disposal, from her trusty sword to some far more arcane abilities.